Isn't it interesting if healthy food comes in a flavorful and delicious form??!!! Oregano also know as Karpooravalli is a easily available herb in India. It can be grown in home garden and used for medical purposes. It cures cold and is a soothing herb for soar throat. 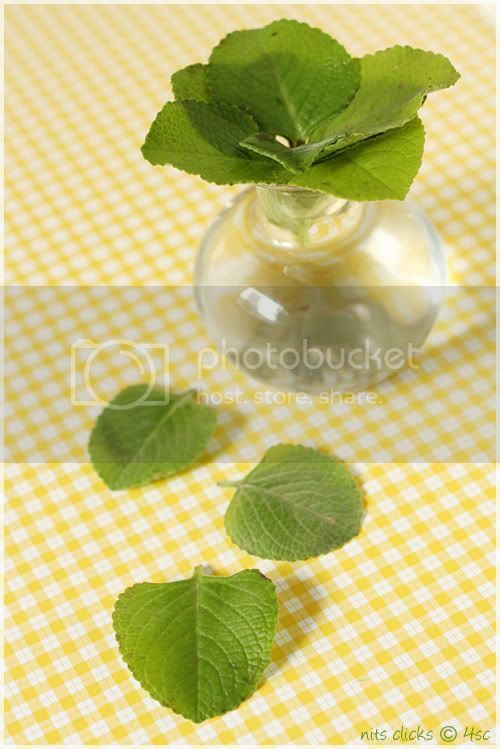 Pluck, clean and wash the oregano leaves thoroughly and spread them on a clean cloth. Mix a batter of besan, rice flour, chilly powder, garam masala, coriander powder, cooking soda, ginger garlic paste and salt by adding some water to it. The consistency should be that of bajji batter. Now heat some oil in a pan. Dip the oregano leaves in the above made batter and fry till done on both the sides. The same batter with the flavoring can be used for onion, potato and banana bajjis too. Never knew Karpooravalli is the Oregano. Nice clicks Nithya. 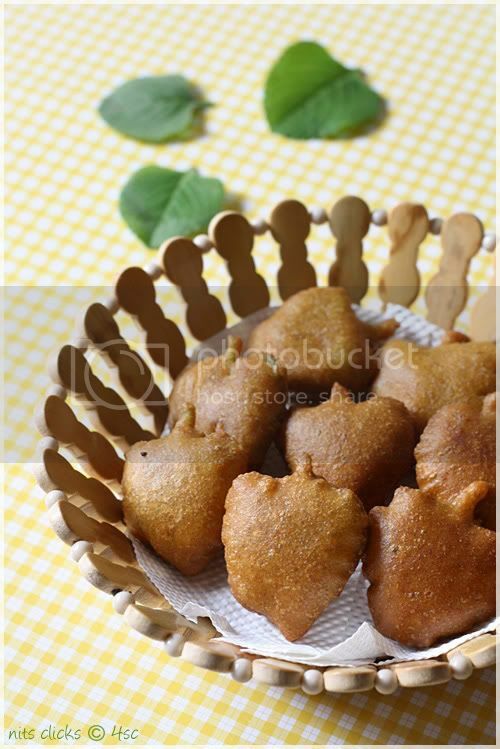 I love the leaf shaped bhajji one very much. 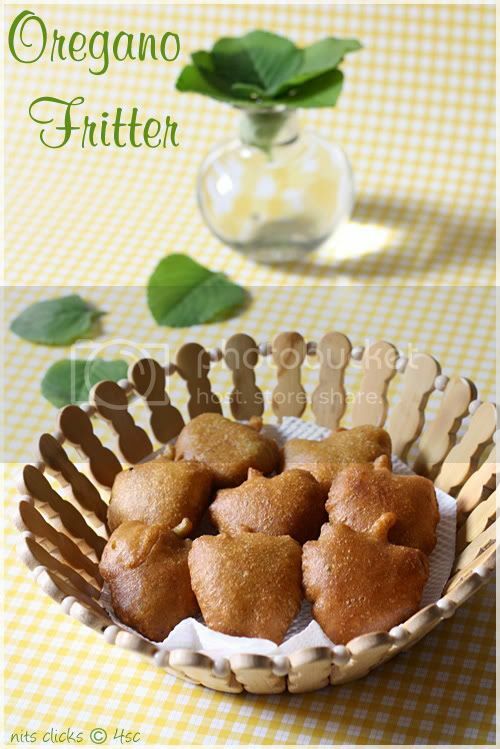 Fritters look so delicious and tempting. Nicely shaped bajjis. These leaves in malayalam is called as "Pani Kurka". I didn't knew that this is called as oregano. Just awesome and healthy too.Loved the shape of the bhaji. Wow!,very innovative and interesting try.Luv it. I love oregano smell and taste, I'll try this recipe! Nice appetizer n its really unique nithi. Presentation is mind blowing. wow, that sounds delicious and very intriguing. Love the heart shaped bajjis very much! Love that heart shaped bajji, super crispy. very interesting and delicious fritters, wonderful clicks as usual..
had no idea it was available in india..so the dried form can be used in italian cuisine right? 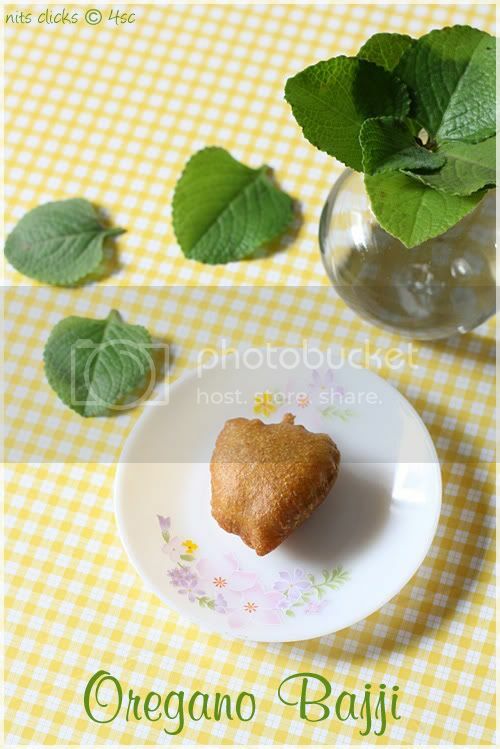 Sigh..if it wasnt for the deep frying, i would ahve fallen flat for this bhajji..
love the leaf shape bhajji...it's a very unique one too..
interesting bajji...i used to give this leaves for my daughter when she gets cold...next time will try this bajji and give it to her...thanks for sharing! I never knew that oregano is the name of this leaf...I used to give this to my baby when he used to get cough, cold & chest infection.Thanks for the info and the bajji is very innovative and looks super cute with that shape...Great pics..
Wow...lovely snack n I love those heart shaped fritters...h u able to get the leaf shape perfectly? Great...wonderful bhajis...wonderful pic as usual!!! Have a bright and happy life ahead and God Bless you Dear! What a perfectly shaped bajjjis..Like Nisha said I didnt knew too that oregano leaves are available in India..
Heard from Priyas blog that u r getting married,her bridal shower party lead me here..All the best to u ! Wow.. nice clicks. Loved your space. First time here. happy to follow you. Nithya,I found you on R's blog and went through the bread dosa recipe posted in honor of the soon to be bride and her bridal shower:)!! 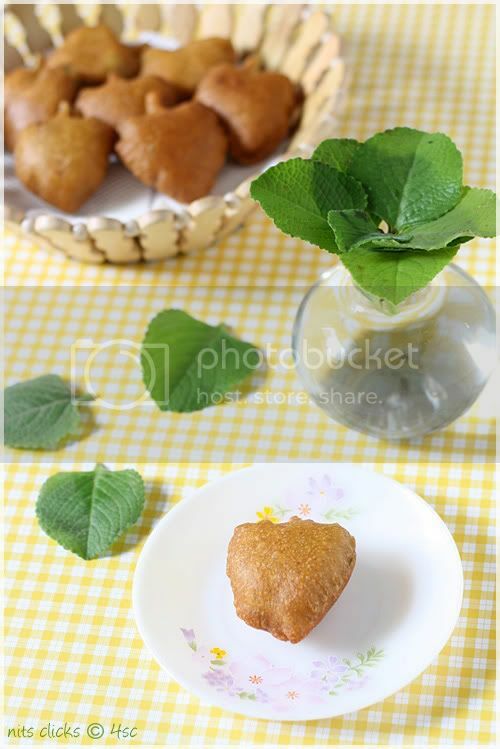 !Many many congratulations.I am glad I stumbled upon this great blog,love these fritters and the perfect shape they hold.Many many good wishes for the D day and look forward to your posts,I have added myself to your list of followers:)!!! had no clue about Oregano's Indian name :) And hey, congratulations on the good news!! Have been following ur bridal shower across blogs and must say, ur one lucky girl :) all the very best for a wonderful life ahead! Never knew that what we call ajwain leaves is also same as oregano. Love the pics and the bhajiya. Your photo has been used for publishing this recipe in the Hindu paper. Check this link! Hey...have been following for awhile, love your enthusiasm and creativity! Just wanted to mention, karpooravalli (omavalli or ajwain) isn't oregano. It's supposed to taste like oregano, that;s all!